You know I haven't done a single Christmas mani yet! I can't believe Christmas is less than two weeks away. I've really got to get into some Christmas nails cause I'm seeing so many gorgeous ones on blogs at the moment. Usually at this time of year at work, things as starting to quieten down and you have a bit of time to stock take on where you are at. Not this year. I don't know why it is, but this year there are so many people at work who need stuff finished before the end of the year, and at the moment I just don't see how it's all going to get done. So at the end of a long and crazy work day, after my littlies are asleep, I love to play with my polish. It relaxes and unwinds me. 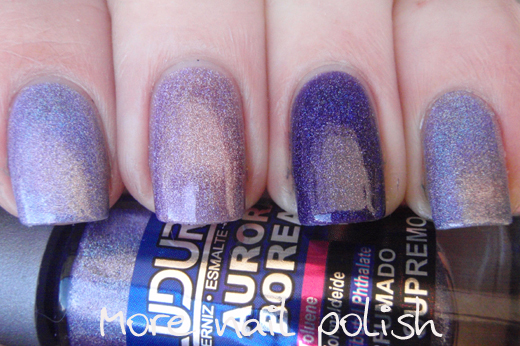 Today's polish is another from the Ludurana Aurora Boreal collection, which can be purchased from llrowe. 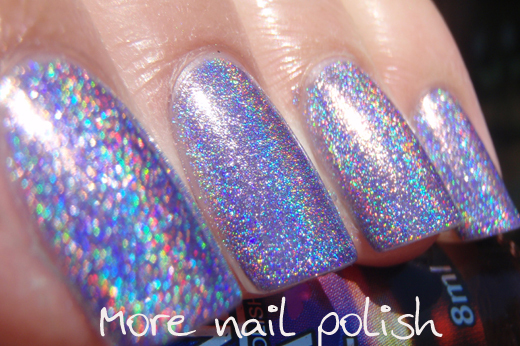 This is this prettiest lavender colour holographic polish. I did three coats here, but only needed two. I just did three cause that is what I was doing with all these polishes. 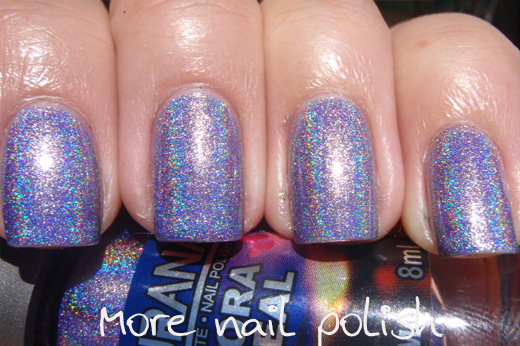 So now a quick colour comparison with some other purple/lavender holos. On the index and pinky are Supremo, on the middle finger is OPI DS Original and on the ring finger in HITS Dionisio. I've previously compared Dionisio with Ozotic 513 , which is why I didn't include it here. As you can see, Supremo is more blue toned. It is also much more opaque than OPI DS Original. 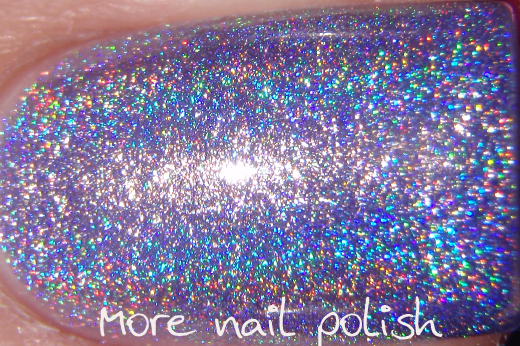 Whoo hoo, another unique holo colour! And no bubbles from this Ludurana holo. It's wonderful how it shines! Sooo pretty!! Im in love! That brand has always amazing stuff! 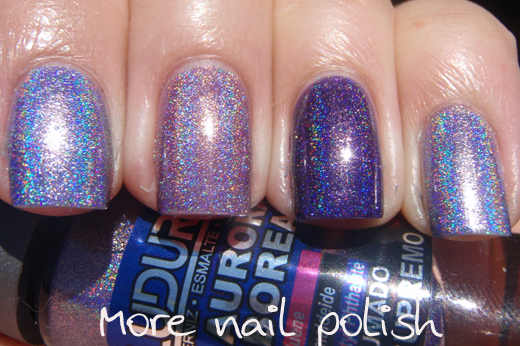 I'm mad about Ludurana's polises... they're perfect and these holographic ones are damn gorgeous!!! I have many bottles of this brand. This one that you're on it's beautiful indeed! I was wearing this the last couple of days and it was more blue on me. I did see a hint of purple once lol.